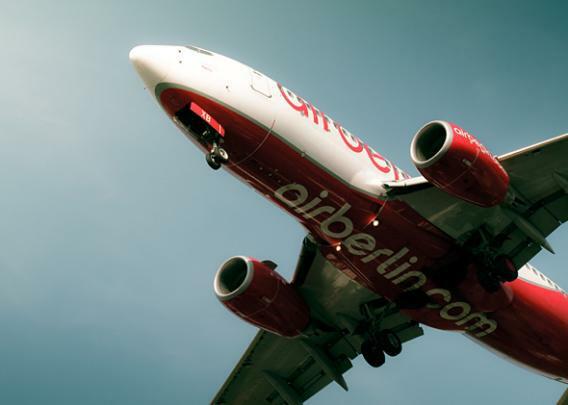 Air Berlin lost luggage: The German airline melts down on social media. Rubbernecking at Air Berlin’s spectacular social media meltdown. If you’re looking for your afternoon fix of schadenfreude, you should mosey over to the Twitter and Facebook feeds of Air Berlin. Over the past few days, the social media presence of Germany’s second-largest airline has become a mesmerizing spectacle of shaming and apology. As with any train wreck, it’s hard to look away, but watching a company, rather than an individual, melt down on the Internet seems especially surreal. Maybe the German language has a word for it. My word for it is oy. Air Berlin has hubs at the Berlin and Dusseldorf airports. It primarily serves bustling European cities, but its flights go to 150 destinations all over the world. It’s got a fleet of 129 aircraft and earned profits of less than $9 million in 2012, the same year it joined Oneworld Alliance, which includes aeronautic heavyweights like American Airlines and British Airways. (Ledgers from previous years are swimming in red ink.) But the company’s best-kept secret—now a secret no longer—is that it is a portal to a strange, disorienting, Kafka-esque universe in which bags disappear or are abducted, and the bureaucracy in charge of locating them tweets bromides at you while adamantly refusing to help. Scroll up and the saga continues. “Any more news from anyone? Still says ‘delivery process initiated’; but no further info. Still unable to reach the baggage office,” one man wrote, four days later. “I rarely complain to the world wide web, but @airberlin and @airberlin_US = worst customer service ever. It continues, for the airline company has apparently performed genuine miracles of incompetence. They misplaced the equipment of two different bands in one month, first forcing the Swedish metal group Sabaton to postpone a concert (for lack of instruments) and then spiriting away the tools of the trade for a trio of Toronto rockers. Nicht halten Sie Ihren Atem, Freunde. As shown by the below exchange between a customer and a service representative/Twitter bot, seeking to recover a bag from the Air Berlin vortex lands you in an uneasy layover between the company hotline and the airport Lost and Found. Few who venture into this geography of evasions and runarounds return unscarred. Arrived in Dusseldorf without my bag. @airberlin are useless. No apology, no idea. What happened to German efficiency? @_5foot1 We're sorry for the inconvenience caused. Did you contact the Lost & Found at Düsseldorf airport? @airberlin of course. Bag left in LDN. No assurance it will be on the next flight. I'm here for business meetings with no clothes. @_5foot1 Unfortunately there is no number I can give you, the Lost & Found will get in touch as soon as they found your bag. The business has not yet responded to Slate’s request for comment. Whoever runs its Twitter feed is very busy trying to stanch the blood flow. Initially robotic apologies are becoming more contrite (if you can measure contrition in exclamation points), even though the message remains the same: Please contact someone else. While speculation that the company may soon waft up to the great tarmac in the sky has quieted with its Oneworld merger, Air Berlin’s total inability to transport a Delsey suitcase from point A to point B can’t be a good sign. If all fails, though, they could have a future in marketing chocolate hearts. Chocolate hearts! This Air Berlin motif attempts to sweeten the otherwise ireful newsfeeds, sometimes as a verb—“We #chocolateheart Kolle,” “We chocolateheart the world!”—and sometimes as a tinsel-wrapped talisman against customer hate: “The chocolate heart is an airberlin trademark and is presented on many airberlin flights as a farewell gift to guests as they exist the aircraft,” explains a press release. These sugary frills amid all the teeth-gnashing mark Air Berlin as either egregiously out of touch or invested in some kind of dada rage-candy performance art. Regardless, here’s where a Teutonic philosopher would offer a stunning insight about the role of social media as a leveler. Facebook and Twitter increase accountability by bringing mighty companies face-to-face with the everyday people who use their services. Consumers can band together and share experiences. Plus, the public nature of it all makes these platforms a great new forum for the ancient and eternal pastime of shaming. How would Adorno unpack the irony that it’s when businesses try to burnish their images by turning to Twitter and Facebook (“we’re so hip and accessible!”) that they most risk losing control of their brand? What would he make of the queasy drama of Air Berlin’s corporate unraveling? Where did all the luggage go, anyway? Amid so many questions, only one thing seems clear: Whatever you do, don’t fly Air Berlin.